Cal here for Tuesday Stretch. I wasn’t quite sure what I would share with you this week until I ‘got lucky’ on Sunday at a nearby antique mall here in NC. As soon as I made the purchase I thought, “this would be perfect for Tuesday Stretch” so here we go. 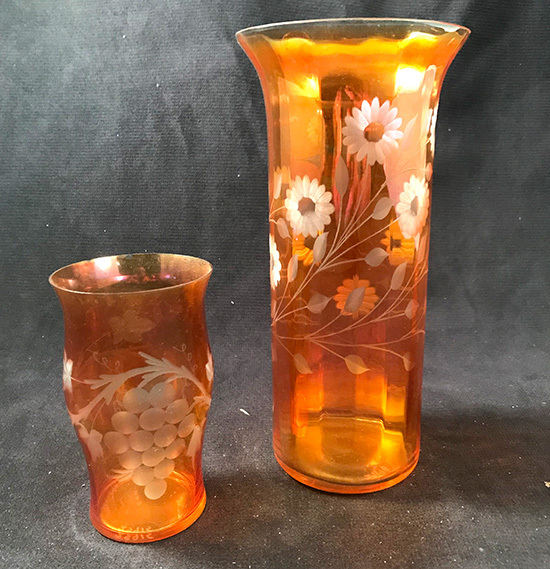 The ‘find’ was a marigold Fenton cylinder vase with flower wheel cuttings and a marigold Fenton tumbler with the grape wheel cutting. These items still contain the Fenton Museum numbers, confirming that they were once part of the glass in the museum collection. As you may know, in some cases sets and pairs were broken up and sold separately in the Fenton Museum auctions. This was not apparent, except to those who were very familiar with the contents of museum, in the first auction. But in the second and third auctions when similar items appeared in the listings, it was clear that break-ups had happened. There were several of us who tried to re-unite pairs and sets by making purchases in multiple auctions, but there are still partial sets and orphans in collections. 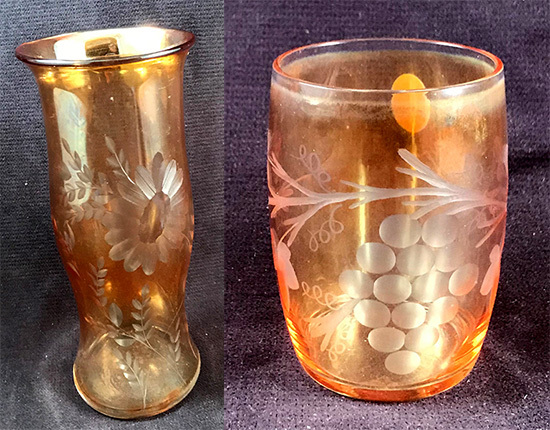 On Sunday I believe I found one of the ‘orphan’ tumblers and now it can be re-united with others from its family which I purchased at one of the auction sales. This still only gives me 4 of these tumblers; presumably there are 2 others as these were usually made in sets of 6. One of the interesting things about this tumbler is that it has a relatively new Fenton logo sticker on it. This may indicate that it was sold in the gift shop, not in an auction. 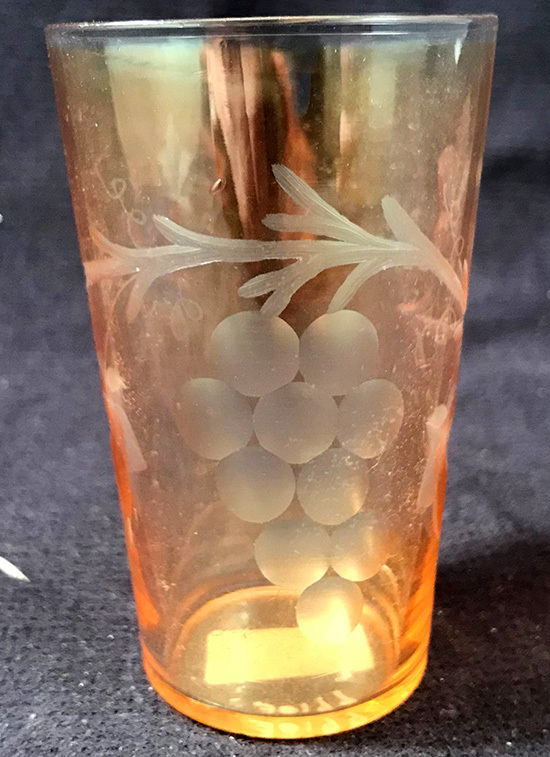 A number of early period stretch glass pieces made their way into the gift shop as Frank’s closet was being emptied and most of the items sold in the gift shop had this style Fenton sticker applied to them. 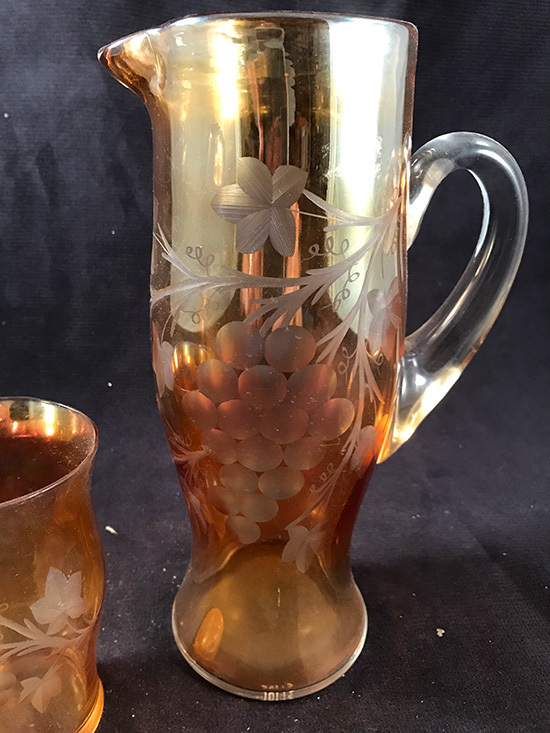 The vase is an interesting find because I have another vase very much like it but with the grape cutting. It would make sense that the Museum collection had vases with both cuttings. In a way, this is also a re-uniting of a pair. 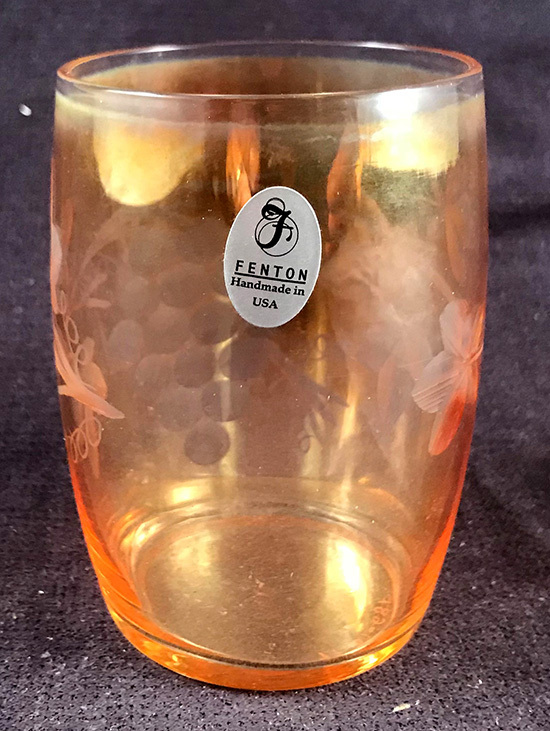 The wheel-cut items were apparently done at Fenton because we find the same cuttings on various items made by Fenton but we don’t – to my knowledge – find them on anyone else’s glass. Most often the cuttings are on vases, pitchers and tumblers. 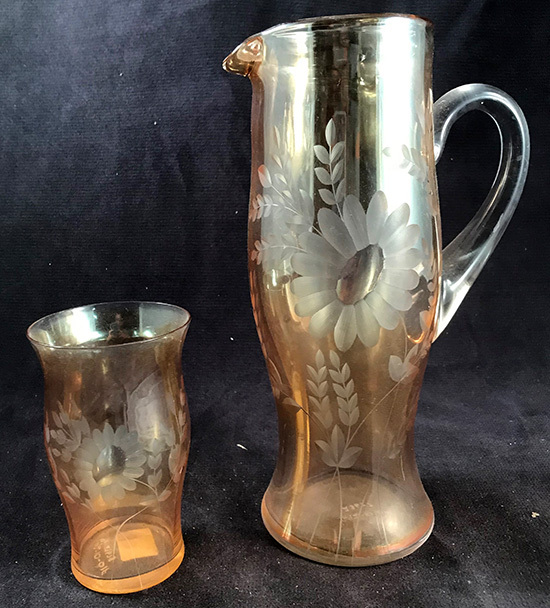 There are several sizes of tumblers and more than one style pitcher. A tumble-up also is known and there may be other items of which I am not aware. Most of the items with the wheel cuttings are marigold and could be rightfully claimed by carnival as well as stretch collectors. The finish has no stretch affect, but they were made during the early stretch period, so they are considered stretch glass. Based on the iridescence, they seem to me to meet the definition of carnival glass, as well. This photo shows two additional pieces with wheel cuttings. 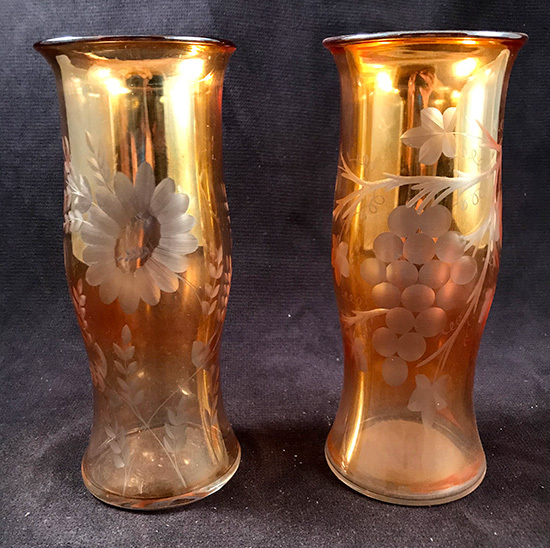 The cuttings are different from the ones in the previous photos and the marigold color is deeper in this vase and tumbler making me wonder if they were made by another company. You have no doubt noticed the amateur photos this week; Dave Shetlar doesn’t have photos of these pieces so I had to take some photos in my photo booth. These are tough items to photograph under the best of circumstances. My photo booth is far from the best of circumstances, but hopefully you are able to enjoy the glass. It is truly beautiful. What I remember from the auctions was a general lack of enthusiasm for the marigold wheel cut items. 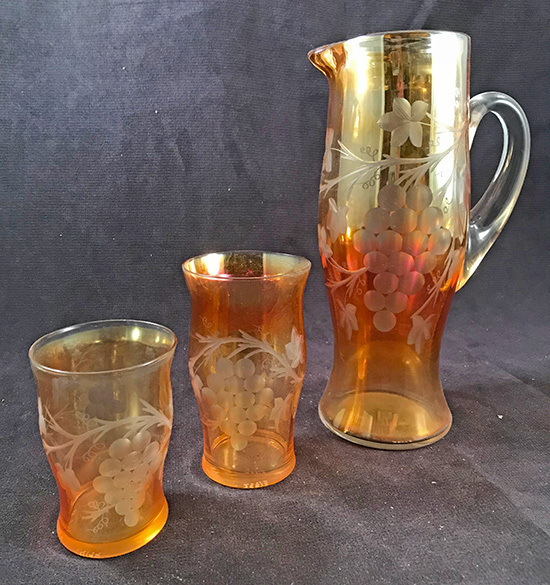 I recall them selling for reasonable prices without many bids and I was happy to get them because, at the time, I did not have any of these items in my collection. The wheel cutting on the items is exquisite. 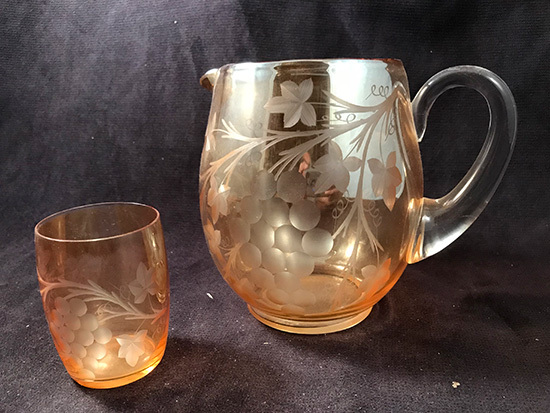 While we saw some of the pieces with cuttings being bought and sold in the market prior to the Museum sales, it was the Museum sales that provided more of these items for collections. Wheel cuttings also appear on Fenton’s Florentine Green, Topaz, Celeste Blue and Wistaria stretch glass – and possibly other colors. Maybe we can take a look at some of them another time. Other companies also added cuttings to their stretch glass, but that is also a topic for another Tuesday. We would love to know of other items you might have with these, or other cuttings. It’s easy to share: just click a photo and email it to our hosts. Thanks for sharing and thanks for being interested in learning more about stretch glass.